College coaches live by a simple code: Always Be Recruiting. Every day, everywhere you go. Dinner with the wife? Choose a restaurant where the busboy runs a 4.5 forty. Mission trip with the church? Audition a kicker or two from local soccer games while you're in-country. Stuck on a lengthy layover? Ask the flight attendant to buzz any fellow passengers who earned at least three stars from Rivals. Never pass up an opportunity to recruit. Hecklinski, filling in for Michigan head coach Brady Hoke, who was in Houston last night for the Bear Bryant Award ceremony, launched into a detailed presentation about the Wolverines' way of recruiting — a little too detailed for Dantonio's taste. Dantonio, who was mic'ed up, cut Hecklinski off mid-presentation and summoned the rest of the panel members to the stage to, as he said, talk about more than just recruiting at Michigan. A red-faced Hecklinski took a seat on the stage, joined by the rest of the panel, which included coaches from Wayne State, Siena Heights and Alma. "Let me stop you right there, son. You think we brought you, a chief recruiter from Michigan, onstage to talk about recruiting at Michigan?" Properly chastened, Hecklinski and the other coaches spent the rest of the event discussing and fielding questions about issues in high school football and recruiting. Afterwards, he and Dantonio both chalked the altercation up to a "misunderstanding" in the format, with Heckniski telling a reporter from the Kalamazoo Gazette "I understand my place" while Dantonio insisted he "really didn't know how this would work in this forum." Whatever he was expecting, obviously it didn't include a Michigan recruiting speech. Although I can only imagine how the same scene might have played if it had been Hoke himself at the podium, raising hosannas to the eternal lineage of Michigan Men who have built the swellest tradition in all of North American culture, rather than a young, easily intimidated assistant. Hoke seems to have a pretty good grasp on his place, too, and even after four consecutive losses in the series, it's not being shoved off the stage by a rival. 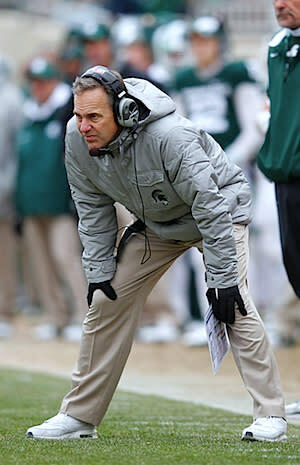 Not that we wouldn't have all loved to see Dantonio try.